I felt great leaving the store! IT WAS A THRILL! It is important when you coupon to know your rights as a customer. And two of my most frequently shopped stores and favorites are of course Wal-Mart and Target. First up…we have Wal-Mart. 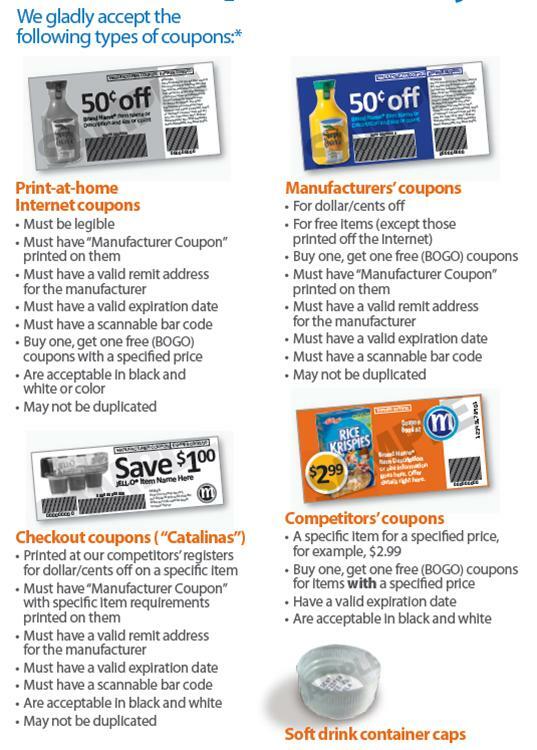 I have physically copied and pasted the coupon policy in this post for you to view. However, there are a few highlight to make you aware of: Wal-Mart will accept check-out coupons (or Catalina’s) from other store’s registers. 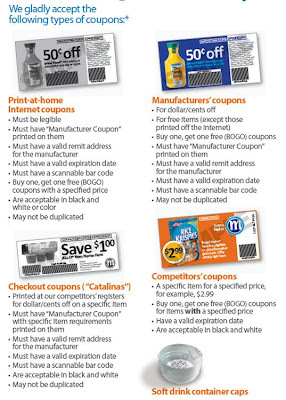 In addition, Wal-Mart will accept competitor’s coupons for a specific price. At Wal-Mart you can ONLY use one coupon/item. However, Wal-Mart will allow you to use a coupon that exceeds the value of the item. The additional savings will be applied toward the basket purchase. For example, I recently went to Wal-Mart and purchased Gain dryer sheets that cost just under $2.00. I had a $3.00 off coupon, so I actually got the item for free and had an additional $1.00 off the remainder of my bill. Target is fabulous because they will actually accept TWO COUPONS PER ITEM. That’s correct…they will accept a manufactures coupons and a Target coupon (you can print them off Target.com) for one item. For example, just yesterday I purchased Huggies diapers for Mur-Man using a $2.50 off Target coupon and an additional $2.50 off manufacturer’s coupon. Also, Target does not accept competitor’s coupons. My advice to you is to know your rights….consider carrying a copy of the policy with you...AND START SAVING! Lori, what about electronic coupons, like from my phone that has a bar code to scan? Have you used these before? I have an awesome app but haven't tried to use any yet. I was wondering what your after-coupon total would be at Target. You had quite the stack of coupons! The cashier guy was totally cool with it right? I could tell he was coupon-friendly. Yes, Stacey totally cool! Remember--wom-mom followers! It is important to shop for a good cashier. Holly--I unfortunately, don't have a smart phone...but I do know Ethne does. We will research and post about this soon.